This simple KOrganizer guide explains how to make one month planning that everyone can practice. 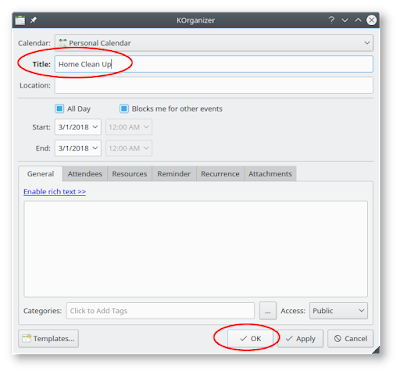 The goal of this guide is to make everyone able to use KOrganizer to manage schedules. The most awesome of KOrganizer is the coloring of schedules by category and everyone can make it easily. 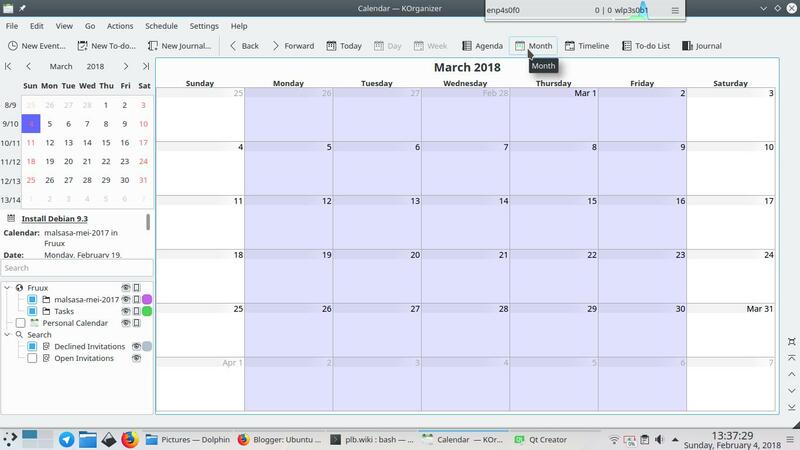 KOrganizer is available by default in Kubuntu (or can be installed by user in another distro). This guide wants to make a one month schedule with category colors that is simple to understand. 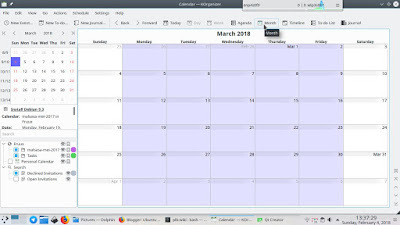 Go to Month view for current month. Suppose this month is March 2018. Double-click on 1 March > a dialog appears > insert schedule name "Home Clean Up" > OK > a schedule created. Repeat step 2 to make a full month schedules. You will find all schedules are in green color. To color your schedules, you need to make categories first. Go to menu Settings > Manage Categories > type a category name "Home Work" > press Create new tag. Create another category named "Office Work". (1) Go to menu Settings > Configure KOrganizer > Colors & Fonts > see Categories section > select a category "Home Work" > click the color > choose blue color > OK. Repeat this for another categories. (2) Double-click schedule at 1 March > press triple dots button '[...]' > choose category "Home Work" > OK > the schedule is now blue. You can move a schedule to another date by drag-and-drop. Not only that, you can also Copy and Paste it (Ctrl+C, Ctrl+V). It's easy. You can drag a schedule to prolong it for 2 days or more. The schedule will look longer. 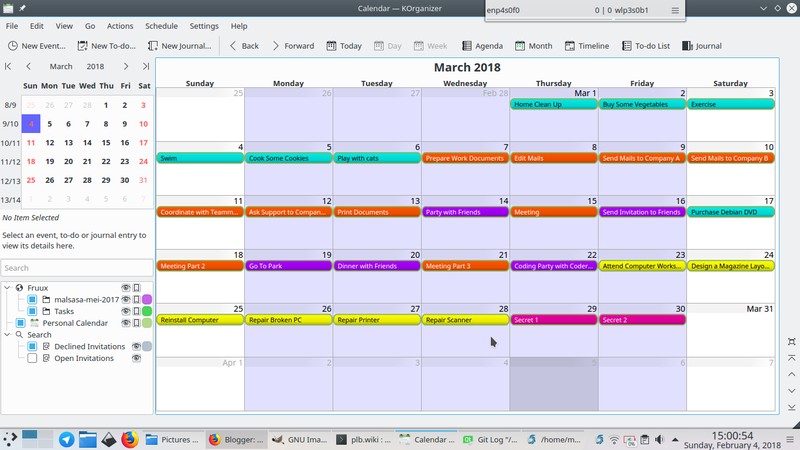 See example below, the schedule "Send Mails ..." in orange color spans 4 days from March 7th to 10th. You may have final result like picture below. You can add more categories and colors as you wish. And, what's next? Next time, you can add more than one schedule per day, set time duration of each schedule, add Location, and more.